How Are Granite and Quartz Countertops Different? If you watch HGTV, you probably know that granite is one of the most widely coveted kitchen countertop materials on the market. But quartz is giving granite a run for its money—and for good reason. While granite is famously tough and offers ample color and texture variation, quartz is tougher. It can be manufactured in virtually any color, too. If you’re in the market for new kitchen countertops, here’s how granite and the upstart quartz compare. 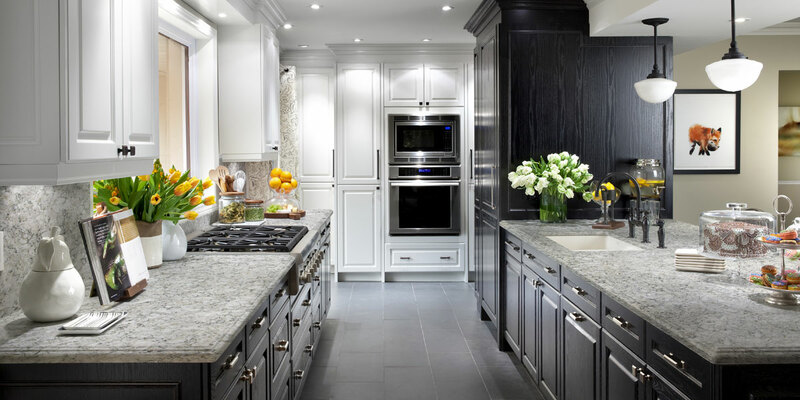 By now, the natural look of granite has settled into the mainstream as the expected high-end countertop material. Granite is a natural igneous rock mined from a quarry. It’s got incredible personality and strength. This stone can contain bits of shimmering mica, feldspar, quartz and more. Granite forms in a wide range of colors and patterns, including white, brown, tan, gold, red, blue and many different combinations. Although the quartz name implies that it’s a solid natural material, quartz countertops are engineered. They’re made from approximately 95 percent ground quartz in a resin base, says HGTV. It also contains pigments for color, which granite does not. 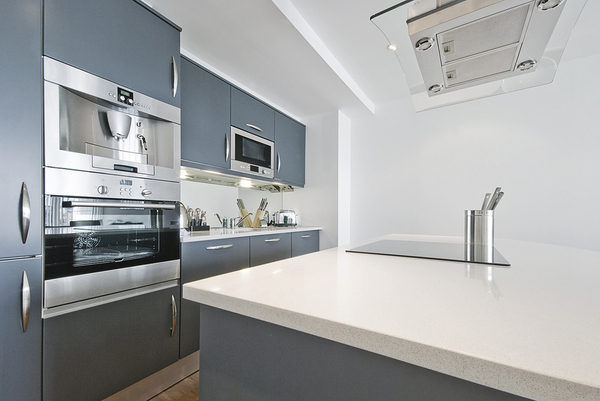 Quartz countertops have the look of natural stone because they’re made from it. 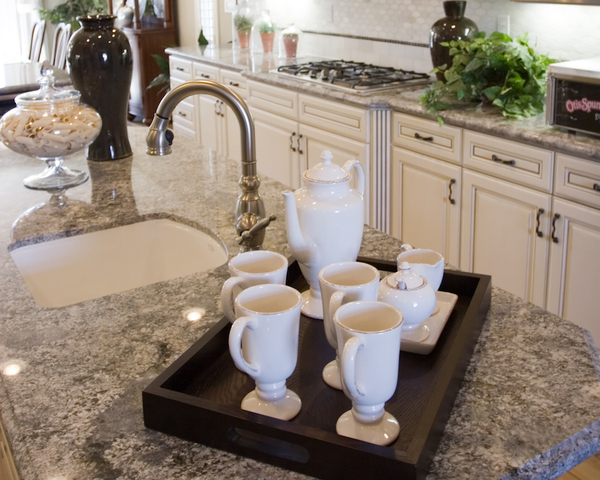 If you need beautiful countertops that are as tough as they are attractive, both granite and quartz will perform well. According to HGTV, granite gives you heat resistance. It’s resistant to impact and scratches, too. Quartz is harder than granite, so it’s less likely to scuff and scratch. However, quartz is more susceptible to “thermal shock”, meaning it can crack when it’s exposed to heat, so a trivet should always be used under crock pots and pans fresh from the oven. Quartz comes in classic white plus an almost unlimited range of colors, and it’s tougher than granite. Both granite and quartz are more resilient than laminates, wood or tile. A hot pan won’t burn them. But quartz has a few pluses that granite can’t offer, even when granite is regularly maintained. While quartz is much harder than granite, it’s not impervious to damage. Under normal use, it should last. But if it experiences a severe impact, it could break. Granite is prone to chips, especially along the edges. Regardless of which material you choose, damage is repairable. Both materials may lose some surface shine over time. And chips or cracks can mar the edges of the countertop. But granite and quartz can be resurfaced to restore the original sheen. Chip and crack repair tend to be virtually invisible. Because granite is 100 percent natural, there’s no way to control its appearance. What’s quarried is what you’ve got. That’s not necessarily a bad thing since nature creates incredible colors and patterns on its own. Quartz doesn’t tend to have the visual variations found in granite. Most examples have a more solid-color appearance that’s filled with natural shimmer from the quartz content. However, quartz is customizable because it’s engineered. If you want red, blue or green, chances are you can find it. Granite has held the hearts of homeowners for many years, and it’s no wonder. Natural granite has character that’s hard to match in any other countertop material. But quartz countertops are growing in popularity. With so many color choices and its hard-as-steel nature, this engineered stone is beautiful and easy to live with. If you’re ready to transform your kitchen into a dream room, we’re here to help. Call Accent Custom Countertops at 775.984.5500 for a design consultation today. Should You Opt for Custom Kitchen Cabinetry? A home’s kitchen is its very heart. You’re no doubt familiar with that sentiment. 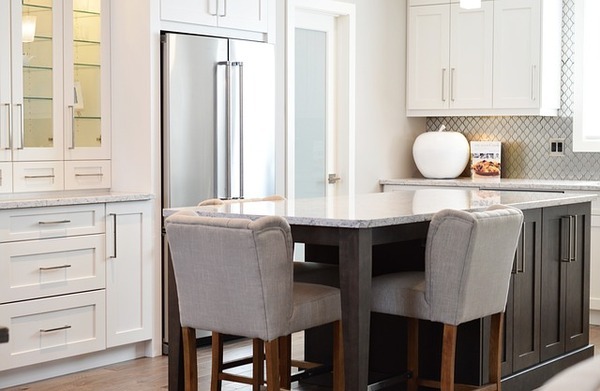 So what better way to treat such a space where family and friends gather than with custom cabinetry that’s built to your standards, not someone else’s? High-end custom cabinets aren’t merely important for their quality, although that’s a definite plus. They help transform an existing home, or one that’s still in the design stage, into something that’s perfect for your family. Stock kitchen cabinets are designed and built to certain standard dimensions. For example, many base cabinets are 24 inches deep and 34 1/2 inches tall. But what If you want something different? Or what if your home is older and has imperfect corners? Not everyone can work comfortably with a standard-height base cabinet. And modern appliances are becoming slightly larger, making some of them stick out beyond the edges of a stock cabinet. Stock cabinets are commonly modified during installation using filler strips and other adaptive measures. But custom cabinets are designed and built to fit your needs and the dimensions of the room. That means fewer gaps that need covering, fewer shims for leveling and a room filled with beautiful cabinets that fit well. Custom cabinets offer choices, and choices make your kitchen special. 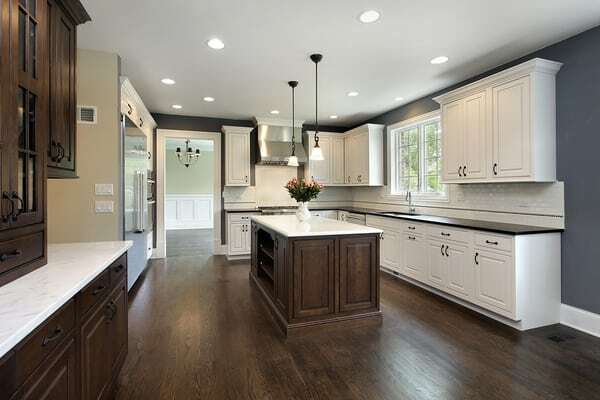 While it’s possible to find what you want in stock cabinets, there’s much to be said for taking an active role in the way your kitchen will look and perform. According to Houzz, custom cabinets offer a level of hands-on design influence that’s not possible with pre-made cabinets. But there’s much more. Custom work lets you integrate special features that make your cabinets unlike anyone else’s. Time does interesting things to style choices. As much as you love your home today, chances are you’ll eventually want to change and update it. With custom cabinets, you get evergreen quality. They’re made to last, even through future renovations. Imagine that one day you want a different design aesthetic. Today, maybe your kitchen is traditional or transitional. But tomorrow, you might have your heart set on something sleeker with minimal detail. With custom cabinets, the base cupboard is so beautifully built that there’s no need to replace it. Just replace the doors and other finish details for a brand new look without another full investment. The custom cabinets you buy today can stay with the home indefinitely, no matter how your tastes change through the years. 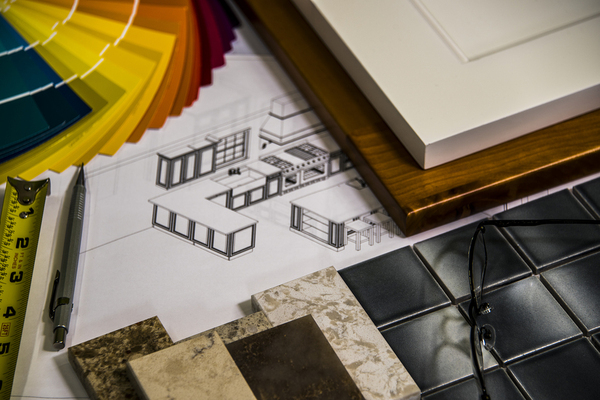 Choices are everything, especially in a custom home. Although stock cabinets offer lots of styles, wood finishes and special features, they can’t compare to the quality and range of possibilities in custom cabinetry. Your kitchen will work hard through scores of family dinners, Sunday breakfasts and special holiday meals. Why not help it look as good as it performs? Call Accent Custom Countertops today at 775.984.5500 for a design consultation. The holidays are over, and there’s a nice, long stretch before the busy warm months arrive. There’s no better time than now to transform your kitchen with some of the smartest design trends for 2018. Quartz countertops are rising to the top as the material to have. Warm woods are still popular, and storage is becoming smarter. There’s so much to choose from now, the hardest part might be narrowing everything down to a single plan. 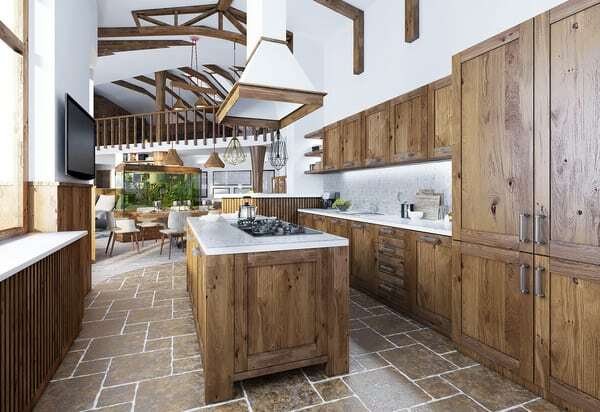 Here are five of the top design trends you’ll want to think about for your kitchen renovation. Appliances have always stood out, whether they were stainless, classic white, the trendy black of the 90s or the now-amusing harvest gold. Now, they can blend with the cabinetry. Integrated appliances are a growing trend for 2018. Cleverly designed front panels for refrigerators, dishwashers, microwave ovens and more have faces identical to the kitchen cabinets. It gives the room a seamless look, which is perfect in an open-plan home. There’s almost no limit to countertop possibilities. 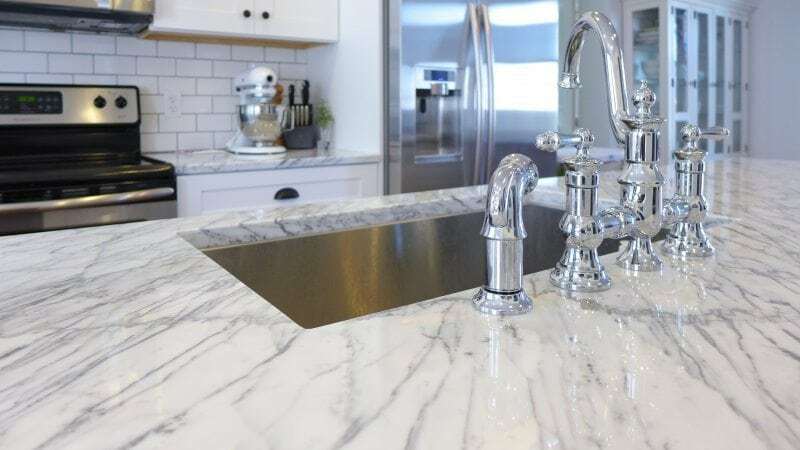 When granite countertops overturned laminates as a preferred material, homeowners around the country started thinking more creatively. In the coming year, expect to see smart, durable quartz countertops take the lead and many other materials make an appearance. Quartz: synthetic stone material made with stone chips and resins. It’s more resilient than granite, resists damage and stains, and requires less maintenance. Better Homes and Gardens says this is a trend to watch. Natural wood: just as durable as laminate, and it’s repairable if there’s damage. Glass: shiny, easy to clean, durable and versatile. Glass comes in virtually any color and it’s non-porous, so it won’t stain. HGTV calls it “one of the most hygienic” materials available. Recycled Glass: one of the most beautiful, durable and eco-friendly countertop materials. It looks very much like a vintage terrazzo floor. Recycled glass contains bits of colored glass in a base of concrete or resin that’s ground and polished smooth. The color combination possibilities are almost endless. Soapstone: stain- and bacteria-resistant. Natural soapstone may be solid deep gray or have a marbled appearance. Care is so easy, it only takes occasional mineral oil, according to HGTV. Contrasting cabinet finishes give the room a homey, established look. Two-toned cabinets in 2018 are warm, substantial and give the space personality. You might spot a sleek black kitchen with one upper cabinet in vivid red, or something more traditional with natural wood finish cabinets and a black or white center island. Two-toned cabinets make the room feel more established like it’s been there and slowly evolved over generations. Designer Jon de la Cruz tells House Beautiful that “you see that kind of make-do cobbling together” in an older kitchen. The Pantone Color of the is Ultra Violet 18-3838. Expect to see it and other shades of purple and plum everywhere, including kitchens. Because Ultra Violet is vivid, you might not spot it on kitchen cabinets. But this trend is likely to pop up in small kitchen appliances, accessories and art. Deeper plums, says InteriorZine, are perfect for cabinets. Choices are everything in 2018, which is why custom design is so important. Look for cabinets built to fit your needs, not one-size-fits-all kitchens that never quite suit the room or your pots and pans. Here are some of the options with custom designs. Custom kitchen cabinets are a smart way to use your renovation budget. Instead of cabinets that merely get the job done, they’re designed with your needs and the way that you live in mind. If you have a kitchen renovation on the horizon, choose cabinets that solve your storage and lifestyle problems. That’s what custom work does best. Call Accent Custom Countertops at 775.984.5500 for a design consultation today. Dekton: Material of the future, now! Dekton is the newest concept in surfacing, described as ultracompact because of the way it is produced and its ability to withstand high temperatures, strong impact and other harsh elements. Cosentino, a world leader in quartz surfacing, developed Dekton at the request of designers, architects, and fabricators. 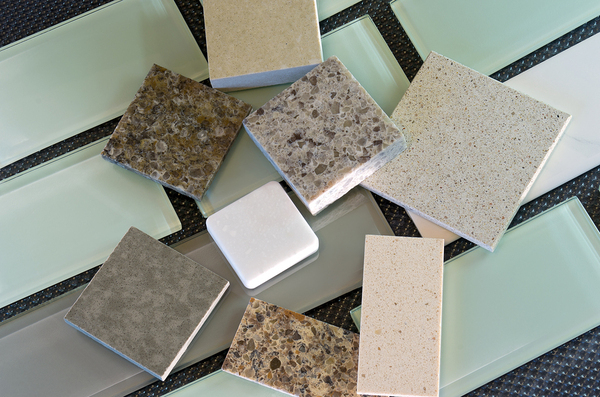 It is a mixture of raw materials used to make glass, porcelain tile, and quartz surfacing. Using Particle Sintering Technology, the process fuses mineral particles so that they link up and change their internal structure. By heating the elements to over 3,000 degrees, they bond and become one without the use of resins or glues, rendering a surface that is virtually non-porous, able to withstand temperatures up to 1,400 degrees and is extremely impact and scratch resistant. What used to take nature thousands of years, now takes only hours using the PST process. What does that mean for me and where can I use it? This is a great question. The answer is: Everywhere! It can be used indoors and out. For vertical and horizontal applications. For decorative or functional uses. Furniture or wall cladding. Countertops or Flooring. Below are several examples of what you can do with this great, new material. 1. Countertops – No need to ever worry about staining or having to chemically seal your countertops like granite or marble. It acts much like quartz surfaces in its durability, but even more so. And, you can place hot utensils, appliances, and cookware directly on the surface without fear of damage. 2. Indoor and Out – Dekton has a very high resistance to flame and heat and is completely noncombustible. The elements will not fade or degrade the material so you can enjoy the warmth of your fireplace for many, many years to come. 3. Flooring – Due to Dekton’s high resistance to scratching and abrasion, whether it’s for your home or in a commercial space, you can use Dekton for flooring without worry of the finish wearing down or the need to re-polish. 4. Outdoor Kitchen – There are very, very few products that can withstand the elements and there is nothing like Dekton. Architects and designers have embraced the material for use in outdoor kitchens, adding to the popularity of them. Snow, rain, summer or winter, this is the perfect material for crazy Nevada weather! 5. Exterior Cladding – Because the material is produced in both thick and thin sheets, it has become an ideal solution for both the inside and outside of the office or home. Installation is done by simply gluing the material to the wall. It never moves, doesn’t fade or wear out. Ever. Now that you know a bit more about Dekton and what you can possibly do with it, don’t be afraid to come up with your own ideas! Here at Accent, we have a wide range of choices in our showroom for Dekton and our designers would love to go into more detail on what it can offer you and your next project! What is the Marble Institute of America “MIA”? The MIA is the authoritative source for information on standards of natural stone workmanship and practice, and the suitable application of natural stone products. The MIA is also a leading source for guidance in ethical business practices within the stone industry as well as safety guidelines that all quality granite fabricators follow. The MIA traces its roots back to 1907. MIA and BSI make sure that the companies they are looking to validate and certify are the most qualified in the industry Before they even begin the process. Accreditation is lengthy and has four different phases that the company must go through before it can be considered including: passing a comprehensive exam, multiple site visits (even by competitors), referrals from past clients, and an auditing of the company’s books. After completion, the accredited fabricator will receive the seal below. This seal helps those looking for quality natural stone fabrication much easier. In the US, there are 86 accredited natural stone fabricators. In Nevada, there are only three including Accent Custom Countertops. Accent Custom Countertops joined this elite group of professional fabricators in March of 2016. At Accent, we promise you only the highest quality of workmanship and craftsmanship and attention to detail. We pride ourselves on the safety and well being of our employees by following only the best industry practices to bring you the countertop that you have always wanted.